Our closest relatives, we all love a chimp. Dressed-up chimpanzees impressively acting out tea-drinking scenarios were used to advertise PG Tips for over 40 years. Jilloch, one of the stars of the PG Tips ads, died at the relatively young age of 34; she was described by a curator at Twycross Zoo where she lived as, ‘shy but friendly, she’s never let fame go to her head’. 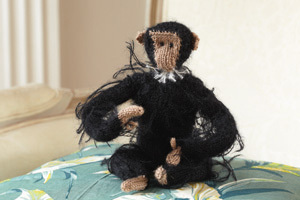 The tea-drinking chimpanzees have now been replaced by a knitted monkey.